France’s trailblazing filmmaking brothers Auguste and Louis Lumiere produced well over a thousand short films, many of them “actualities” consisting of a single shot no longer than 45 seconds, in the late 19th and early 20th centuries. Out of the hundreds of impressive shorts they made that I have seen, one of my absolute favorites has to be their beautiful and kaleidoscopic Serpentine Dance (or Danse Serpentine as they say in French) from 1896. Purely as a piece of eye-candy, this stimulating film of a woman performing a popular vaudeville dance — invented and patented in 1891 by Chicago’s very own modern-dance pioneer Loie Fuller — still manages to charm and impress today. Fuller’s dance, which involved her artfully twirling the long, flowing silk fabric on her skirt and shirt sleeves, made her a hit in France and helped to influence the Art Nouveau movement there. Unsurprisingly, many films were consequently made of different “serpentine dancers” all over the world, including one by Georges Melies, as well as Thomas Edison’s well-known 1894 production Annabelle Serpentine Dance, which featured a relatively crude use of color-tinting as well as a relatively amateur dancer in one Annabelle Moore. The Lumiere brothers’ Serpentine Dance, on the other hand, features a much more dynamic dancer and a much more sophisticated use of color-tinting in which the ever-shifting rainbow-like colors of the film are meant to mimic the multicolored lighting effects that Loie Fuller had designed herself for her live stage performances. The unknown Lumiere dancer — often misidentified as Fuller — is vigorous and whip-fast in her movements, which seem to almost magically combine with the filmmakers’ ever-changing but amazingly precise use of color: the women who were commissioned to tint each frame by hand always stay “within the lines” of the dancer’s costume, an extremely impressive feat (and a rare one for the era), especially given how much movement there is within the frame. The end result, believed to have been directed and shot by Louis Lumiere (a great cameraman who shot many of the early Lumiere brothers himself — including their masterpiece A Train Arriving at La Ciotat), is a film of astonishingly abstract beauty in which light, color, form and movement combine into an exhilarating 45-second blast of pure cinema. This entry was posted on Monday, September 16th, 2013 at 7:20 am	and tagged with Danse Serpentine, Lumiere Brothers, Serpentine Dance and posted in Early Cinema, Film Reviews. You can follow any responses to this entry through the RSS 2.0 feed. 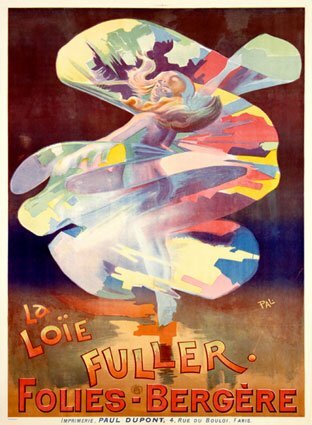 Loie Fuller figures into art history, too. Apparently, Picasso was a big fan, and recent historians suggest her performances and films were an influence on the theories behind cubism — i.e. suggesting movement in a 2-D medium; showing multiple views simultaneously. I have to stick up for Annabelle Moore, though. I think she was much younger and more inexperienced as a dancer when she was photographed by Dickson (compared to Fuller), so it seems unfair to compare her. Moore later became a Ziegfeld Girl in the earliest days of his musical shows, so she must have had something. She retired when she married a prominent doctor. She has a couple of Chicago connections. She died penniless and forgotten in the 1960s. So much of Chicago’s history in vaudeville and musical variety theater has been tossed away. Also, she was supposedly a witness to the Iroquois Theater fire in 1903. Thanks for the additional info on Annabelle Moore, Suzi. Glad to hear she went on to an illustrious career! To Susan Doll: I have you on my blog roll on my site which is http://www.cinematiccoffee.com You are insightful as well too:) I did not know all that history concerning Fuller, but it will be more interesting as I read more stuff about her. Self-promote all you want, John. That’s a big part of what blogging’s all about! And to answer a question you posed above, Kino released a “Magic of Melies” compilation DVD a while ago. It’s part of their invaluable “The Movies Begin” box set.